I couldn’t begin to recall the yarn I used for the fleece blankets, but the granny square blanket below was Red Heart with Love yarn in True Blue, Aran and …Forest Green? 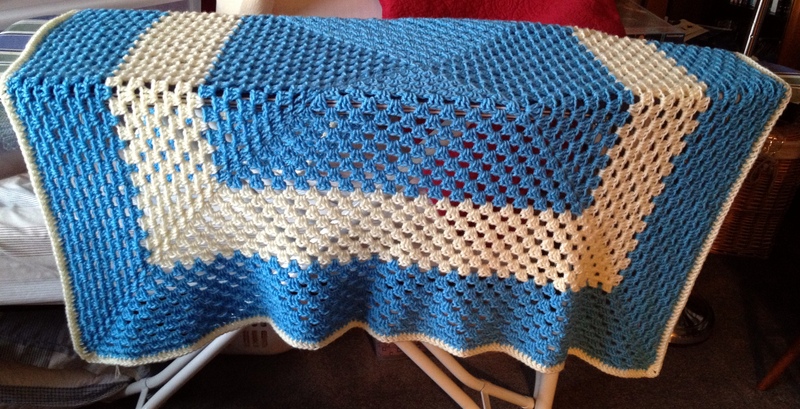 And this granny square was Caron Simply Soft in Light Country Blue, Country Blue and Dark Country Blue. 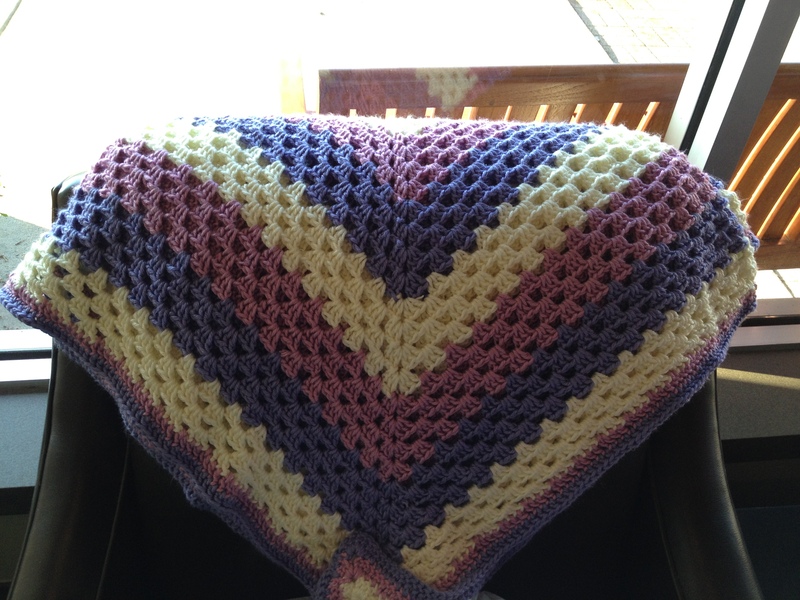 And this was Caron Simply Soft in..something berry and lavender something and.. and off white color. 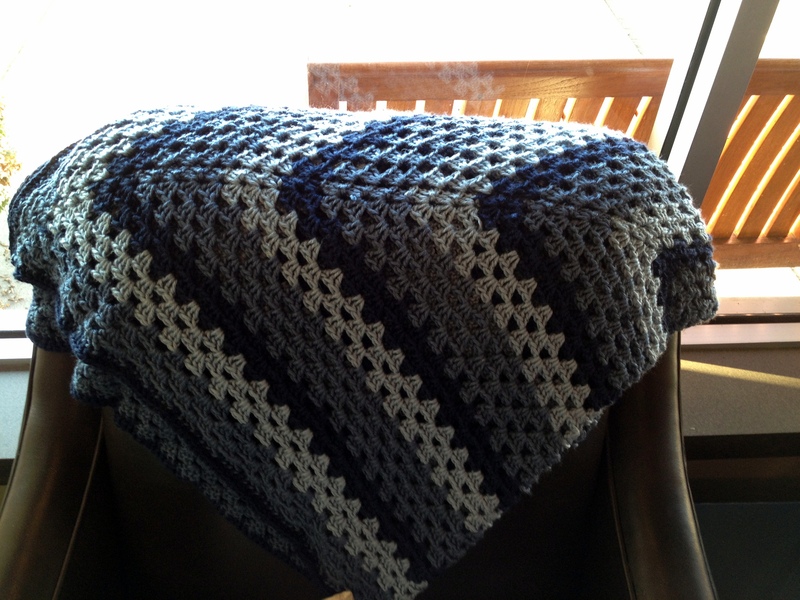 The yarn is Lion Brand’s Vanna White Baby yarn in Little Boy Blue and Lamb. The last row is a simple double crochet, inasmuch as I was desperately running out of yarn. When I turned it in last Monday, the ladies all said that my stitches were even, which I guess is how one judges the work. So I was very happy. 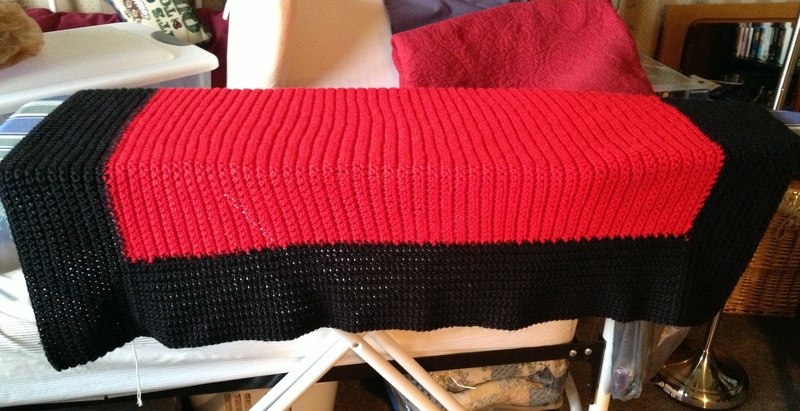 Next we have single crochet with Caron Soft yarn in…red and black. And finally, a Superman fleece panel that I hadn’t gotten to the month before. Edged in Red Heart Bright Yellow. For those in the area, Culver’s Restaurant in Buffalo Grove is having a fundraiser for my chapter of Project Linus this coming Thursday, May 16. I will be there after work! All these posts to do and all I can manage is the Project Linus stuff. On the far left is a fleece with guitars on it edged in Red Heart Soft White and Red Hear Cherry Red. Next is a solid black with appliqued lizard fleece edged in Red Heart..I think it was called French Countryside or something. Next is a solid navy with an appliqued Batman edged in Caron’s light blue. 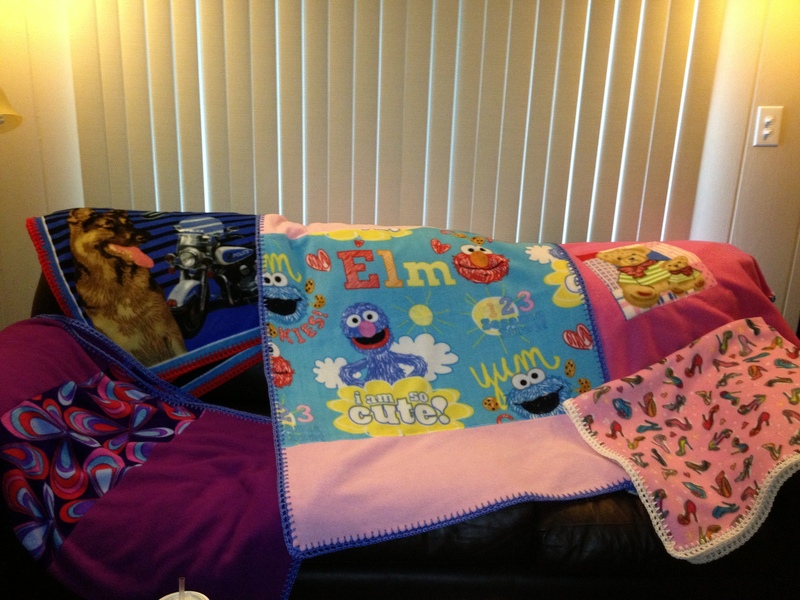 Finally the Toy Story fleece edged in Red Heart..I forget what that purple was called. The neon pink has a lady bug applique and the maroon has four applique teddy bears. 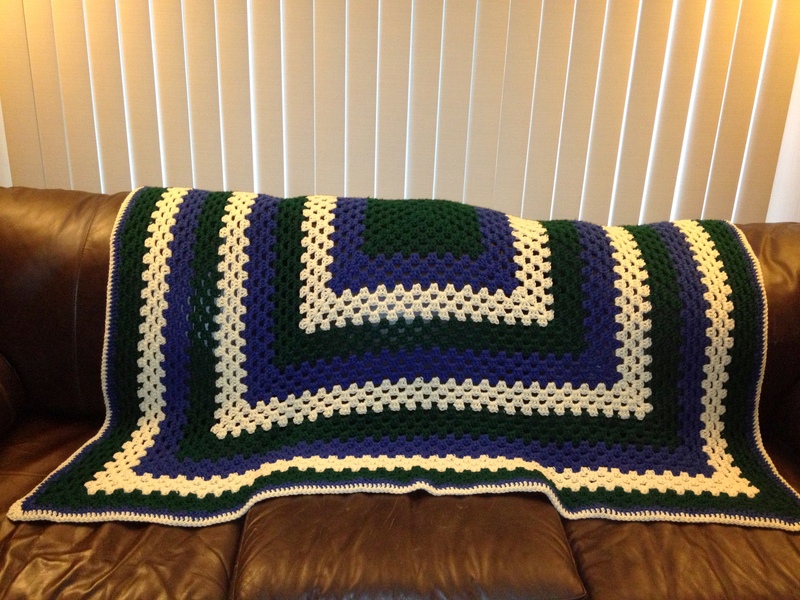 Both are edged in Caron White. Please note, I never do the appliques. One of the other volunteers that cuts and preps the fleece does that. She is fabulous. On the far left is three panels of fleeces, sewn together before I picked it up to crochet the edges. Red Heart yarn in Turqua. 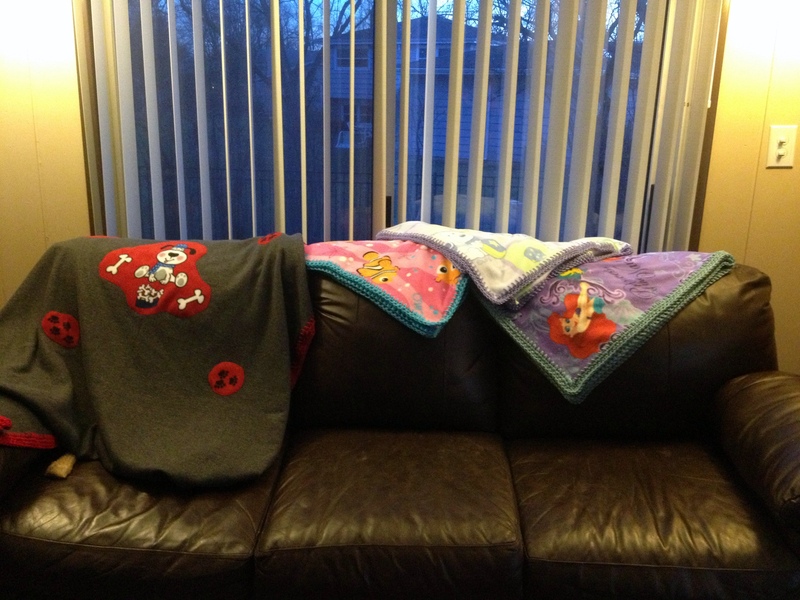 Next are two more princess blankets, and on the right is a fleece with Elmo apliques. Caron white yarn. Above on the left was edged in Red Heart..lemon, I think. 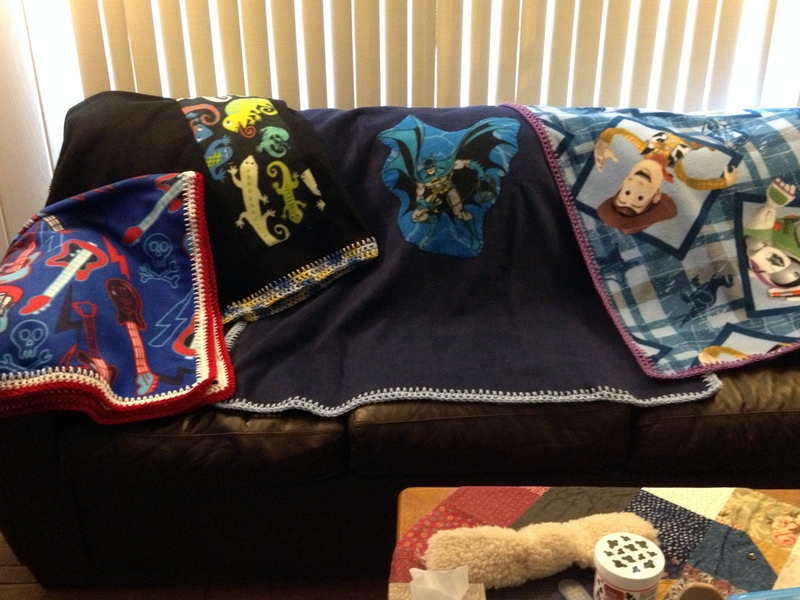 Next was another with sewn fleece panels. I think it had dinosaurs on it and I edged it in Red Heart yarn in Royal. 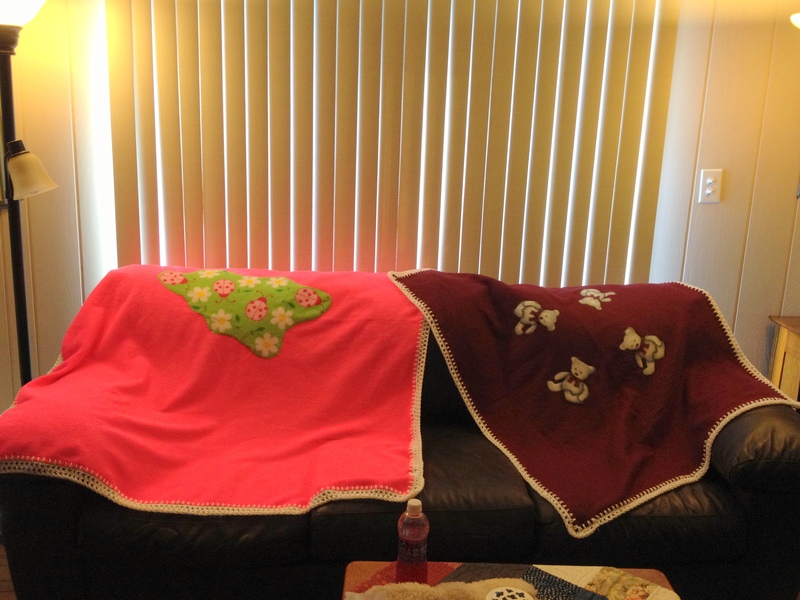 Next, with the daisies is edged in Red Heart medium purple and on the far right are flowers edged in Caron white. I have one more for the month that I finished today. Good thing Starbucks night is this week. 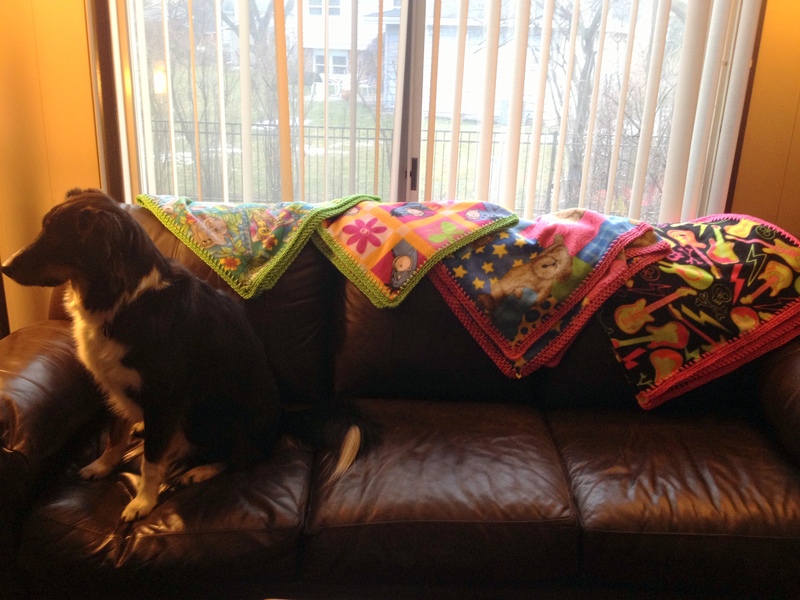 The one on the left that is all messed up from the lighting has dinosaurs on it and is edged in Red Heart Black yarn. The Winnie the Pooh is next, edged in a yellow from somewhere. Next is a doggie pattern edged in Caron White. 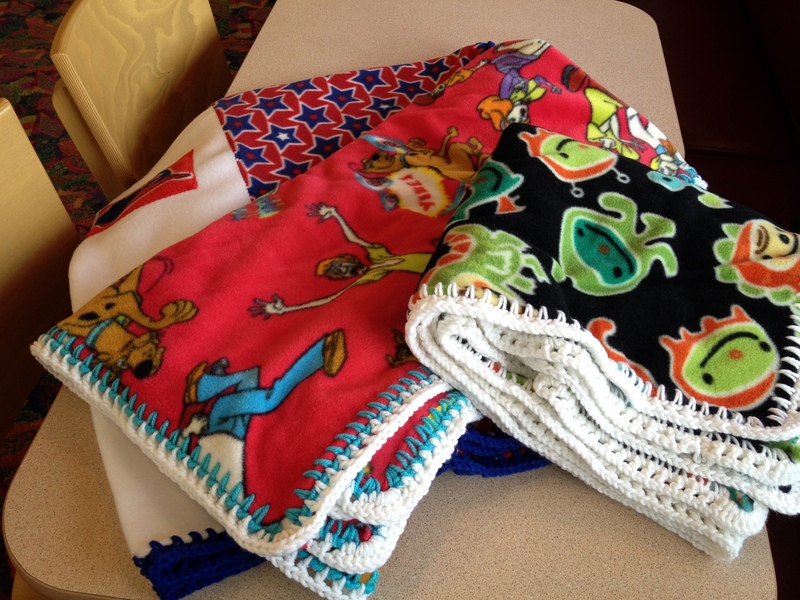 Finally, the Spongebob pattern is edged in Caron White. On the bottom is a blue fleece on which someone embroidered a fleece with a fighter jet. Edged one row of Red Heart Soft White and two rows of Red Heart Cherry Red. Above it is a black fleece with flowers, edged in some sort of purple yarn. 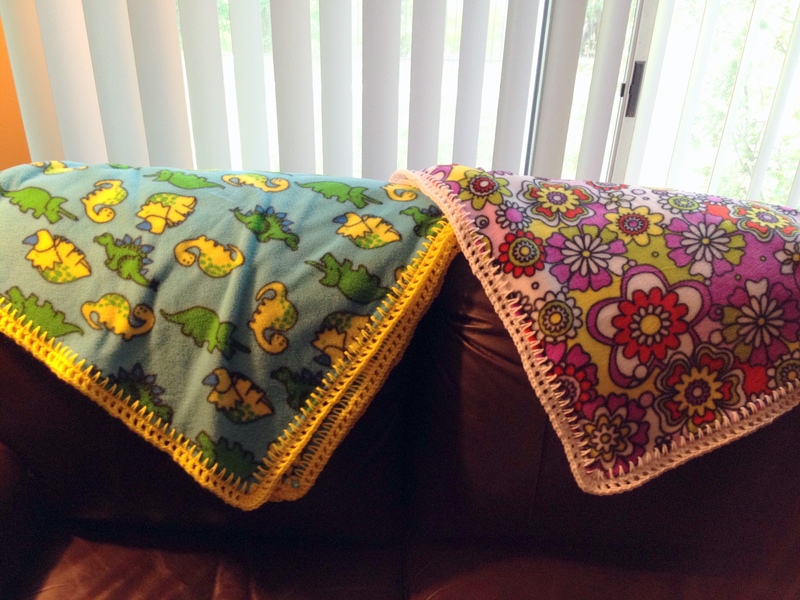 The pink one has turtles on it and is edged in Caron Soft Limelight. Next is a black with an astronomy theme edged in Red Heart Turqua yarn. The red fleece has an embroidered Cubs hat and is edged in white. Finally, there is a Star Wars fleece edged in white. Lion Heart’s Vanna brand in pink, white and..I forget what that gray color was called. Fiona wanted to be a part of this picture, which is my excuse for the bad lighting. On the far left is a jungle-themed fleece edged in Caron Soft yarn in a green color that I think was called Limelight. Next is Eeyore from Winnie the Pooh edged in the same yarn. 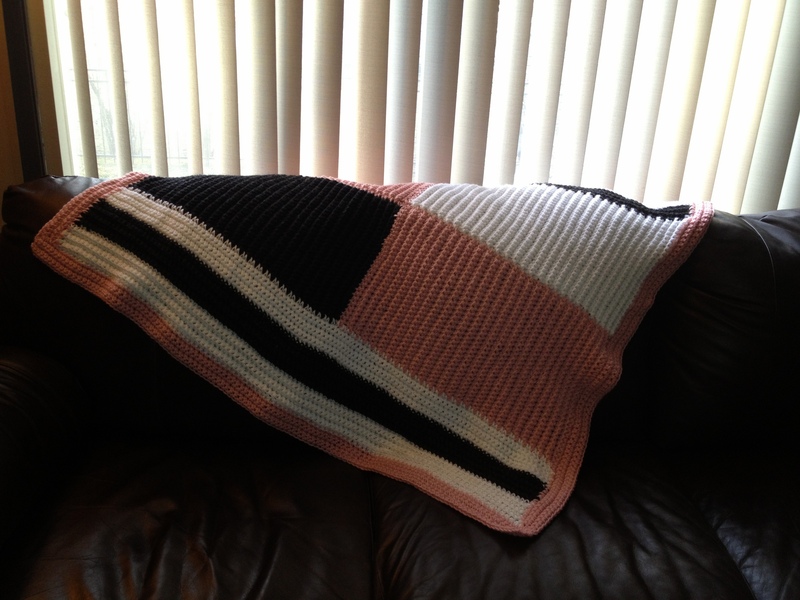 Third is, I think, a Boyd bear fleece edged in Vanna White’s pink baby yarn. And finally we have the neon guitars edged in a bright pink from I forget where. On the far right is the Little Mermaid. The yarn was from Penny’s stash and I have no idea what it was. But it matched. 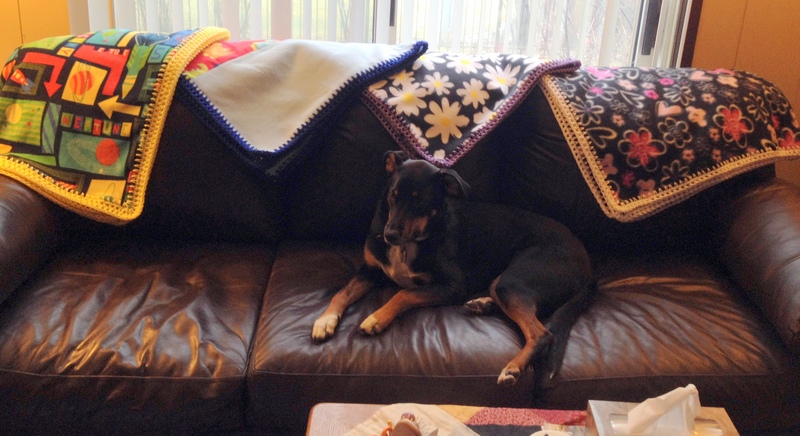 Next is a baby Snoopy that you can’t see on the fleece edged in Caron Soft in lavender. Next to that is a Nemo fleece edged in Red Heart’s turqua yarn. 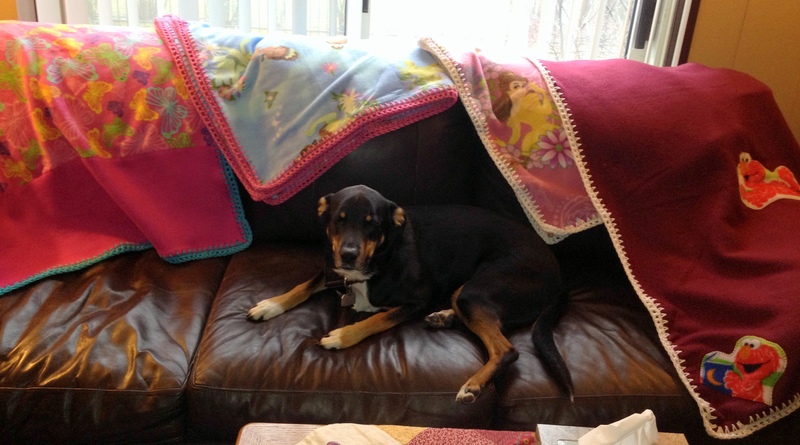 And finally, the grey fleece with the embroidered doggy pattern is edged in Red Heart’s Cherry yarn.